Life can be funny sometimes, or at least very ironic. I write today’s blog at the Panera Bread on West Main in Kalamazoo. Today is June 19, 2010. I’m at Panera Bread writing this because there’s no power at my home thanks to last nights storms. It was exactly one year ago today that I was asked to leave the Michigan Municipal League. One year ago, I met my old boss at the Panera Bread on West Main in Kalamazoo and was told my services were no longer needed. Talk about being without power. After leaving Panera, one year ago, I felt completely powerless. I felt lost. I felt there was no way out. And I went home and I pulled out a bunch of sleeping pills. I counted 35 of them, figuring that 35 pills (one for each year of my life at the time) would help me go to sleep and never wake up again. One year ago today, I wanted to die. But my friends Mariah Davis and Angela Clock saved my life by making sure that I wouldn’t have the opportunity to take any of those 35 pills. I continue to say to them often, how grateful I am that they didn’t let me go. Because of them, I’m still here to figure out what my destiny should be. Thank you again. Now you listen to me. We all have a destiny. Nothing just happens, it’s all part of a plan. I should have died out there with my men! But now, I’m nothing but a goddamned cripple! A legless freak! Look! Look! Look at me! Do you see that! Do you know what it’s like not to be able to use your legs? Did you hear what I said? You cheated me. I had a destiny. I was supposed to die in the field! With honor! That was my destiny! And you cheated me out of it! You understand what I’m saying, Gump? This wasn’t supposed to happen. Not to me. I had a destiny. 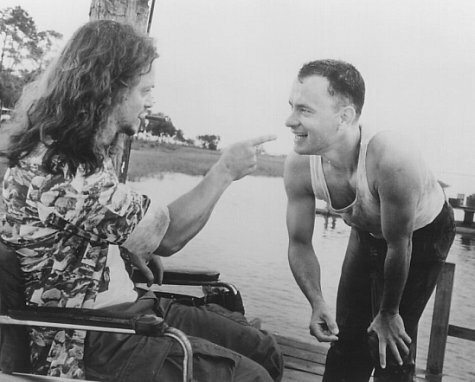 I was … Lieutenant Dan Tyler! Look at me. What am I gonna do now? What am I gonna to do now? Those are a lot of the feelings that I had one year ago today. One year later, I have come to realize that yes, we all have a destiny … but we write it each and every day we’re alive on this Big Blue Marble. We write it each and every day and it can be different. It can be whatever we want it to be. Before, my destiny was to be a success at the MML and in the Lansing Lobby Corps. My destiny was to work my way up in that organization and to make a name for myself at the State Capitol. Today, my destiny is to be a better person than I was before. My destiny is to be a better friend than I was before. My destiny is to not let the little things distract me from what matters – which is my friends and my family. So, here’s to all of the Lt. Dan’s in the world. We may lose our legs. We may lose our jobs. We may lose something. But we will always pick ourselves up and re-write our destinies so that we become what we have always been destined to be. Better than we are right now.